Reston is a pedestrian-friendly place, and the West Market community in North Reston is the perfect embodiment of that. West Market, North Reston offers all of the advantages of living in Reston Town Center...and more! West Market, North Reston offers all of the advantages of living in Reston Town Center...and more! Photo by Karen Fegani. Built in the late 90s, this neighborhood is within walking distance of Town Center (and all the great restaurants, shops, and entertainment there), Lake Anne Plaza, grocery stores (Trader Joe's and Harris Teeter), the W&OD trail, and the YMCA. You don't need a car to live here, but if you do have one it is a quick hop onto Fairfax County Parkway and the Dulles Toll Road. 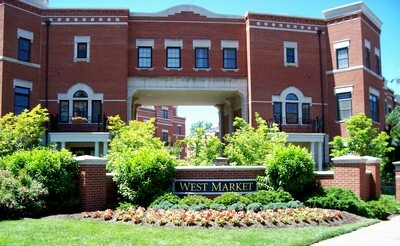 West Market comprises two condo communities: Lincoln Park Condominiums and Madison Park Condominiums. The Lincoln Park community has 104 luxury, 2-story townhome style condos. Madison Park has 122 condominium units, 24 of which are townhouses, accommodated within seven buildings. Five different builders came together to create a community with a diverse architectural style--many people notice the rounded exteriors that are unlike anything else in Reston. Spacious common areas include a club house, which includes a main hall and kitchen for meetings and gatherings, a fitness center and sauna, and an outdoor pool.